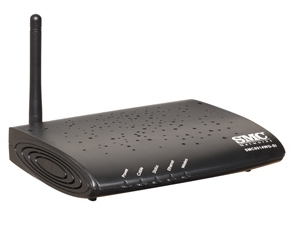 Upon registering for Time Warner's Road Runner internet service, customers are offered a router manufactured by SMC Networks. The router ships with WEP encryption enabled by default, using a 128-bit key based on its MAC address. While WEP encryption is already the most insecure form of wireless encryption out there, SMC Networks amplifies this weakness further by not generating a random WEP key; something which a home user almost never changes unless forced to do so during first time installation, whether it is because he or she is ignorant about the risks of a vulnerable network, or because he or she simply doesn't know how to or care enough to change it. While a randomly generated WEP key can be defeated just as easily as any other, the default encryption key for these routers is trivial and can be determined just by spotting it in a regular AP (Access Point) scan of the area. The encryption key can be discovered in seconds, without the need for conventional wireless cracking tools such as the aircrack-ng suite. These routers effectively have no security whatsoever, as even the most tech-challenged of computer users can break into them. From there, the users of the network are vulnerable to all kinds of harm, ranging from innocent piggy-backing to malware and identity theft. In under a minute, one can find the key using only the router's wireless network name (SSID) and its wireless MAC address (BSSID). These routers stick out like a sore thumb because their SSIDs are simply 4 hex characters (e.g. 'D78A') and their MAC addresses typically begin with 00:26:F3, 00:22:2D, or 78:CD:8E (OUI). Knowing this, any joe-shmo can "hack" into an Road Runner SMC-Networks router with just a smartphone and optionally a pen and paper. I would highly recommend that either SMC Networks or Road Runner move on to WPA2 encryption in their new routers and attempt to update these routers to use WPA2. New Verizon FiOS Actiontec routers come factory default with WPA2 enabled with a randomly generated 32 character string and WPS disabled; they could learn something from Verizon! EDIT: Apparently, the insecurity of these routers was already covered in an article from 2009; it's sad to see nothing has been done about it since then! "However, the Time Warner devices come pre-configured and locked, with URL blocking being the only feature available to the customer through the web administration interface." According to the article, the router's web administration is locked and the home user cannot change the encryption scheme nor the encryption key, even if he or she wanted to. This is definitely a huge issue. This is a great issue you point out. Great review. Keep up the good work.